Whether you have a $400 television or a $4,000 television, your viewing experience isn’t anywhere near as good as it can be. No, we’re not talking about optimizing the picture settings on your TV, though that’s something you should definitely do as well. We’re talking about a simple little gadget that pushes your viewing experience beyond the confines of your TV’s display. 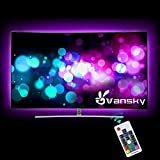 The Vansky LED Backlight Strip is a simple string of LEDs that adheres to the back of your TV and plug into the USB port. Then anytime you turn your TV on, they cast a gorgeous glow onto the wall behind your television. You can adjust the color and brightness with an included wireless remote, and the coupon code YAD3U2HB drops the price to just $11.99. ☑ 16 Color selection — RGB lights: white, red, green, blue, yellow, pink, purple, among others customize your works pace with 27 vibrant LEDs to set the mood and illuminate your hardware. ☑ Alleviates eye-strain — Adds a subtle LED strip lihgt backlight to your monitor, reducing the eyestrain caused by differences in picture brightness from scene to scene in movies, shows and games. ☑ Optimal viewing experience — The color and highlighting brightness of the 60 LEDs are carefully calibrated, making blacks blacker and colors more vibrant. ☑ Easy installation — Fits Any TV Size Up to 60’’,LED strip light is 80 inch can be cut with scissors on the cut marks (white lines) to fit the desired size of your TV. usb cable is 16 inch.Use the 3m adhesive. ☑ Quality Assurance — High-brightness 60 LEDs last up to 100,000 LED lighting hours. What you get- Vansky LED strip light bias lighting for TV with Wireless Remote Control, spare 3m adhesive tap, together with 45 days money back, One year guarantee and friendly, Easy-to-reach support.